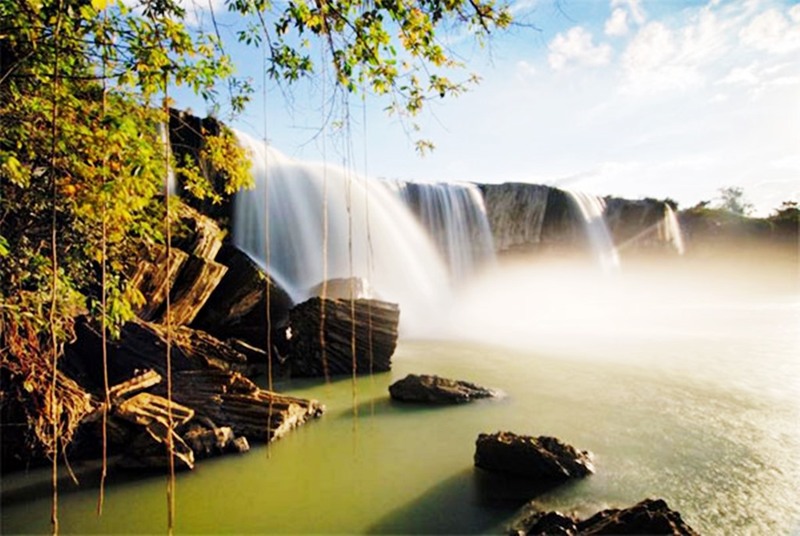 Vietnam Travel Group & Dray Nur Water Fall-With its romantic mysterious beauty, Dray Nur Waterfall in Dak Lak Province is closely associated with many legends of the Central Highlands. The waterfall has become a popular tourist destination. Dray Nur waterfall in Kuop Village is about 25 km south of Buon Ma Thuot City. The waterfall, which is 250m long and 30m high, is the most beautiful and largest of the three waterfalls on the Serepok River. From afar, Dray Nur offers a spectacular panorama. Dray Nur is renowned for its purity and for its incredible legends. Dray Nur in the local language, means Female or Wife Waterfall. According to one legend, a beautiful E De girl and her boyfriend were sitting on a big rock, when a monster appeared in a column of water and drove the young man away. When he returned, he discovered that his girlfriend had been taken by the monster. The rocky bank beside the waterfall is the place where the young couple sat and the waterfall is the column of water where the monster appeared. The sound of the waterfall, according to the locals, is the sound of whispers telling the story. The mysterious beauty of the waterfall inspires all visitors, who are usually curious about the legend behind it. 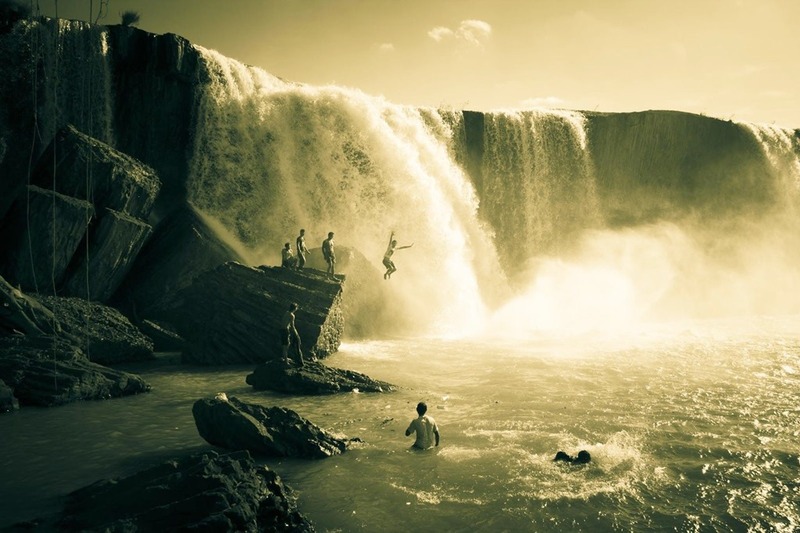 Nguyen Quang An is a photographer from Ho Chi Minh City: “The Central Highlands is spectacularly beautiful with magnificent mountains and waterfalls. There are mysterious Rong communal houses in the central highlands. The nature here is fantastic and the people are wonderful”. The magnificence of Dray Nur might make some feel dizzy but for adventure lovers, visiting the waterfall is an impressive experience. Quang Quy is a tour guide: “Dray Nur consists of three levels creating three lakes. You can swim in the first lake because the water is shallow. In the second lake, you must be careful because the rocks are very sharp. In the third lake, the water is quite deep, between 8 and 10m. From this lake, walking along the rock bank, you can enter a cave. Also from here, there is a panoramic view of the waterfall”. The cave extends more than 3,000 square meters. Stalactites and stalagmites in the cave create an extraordinary scene that delights visitors. It is also possible to hike forest trails and contemplate centuries-old trees whose roots embrace the rock or admire bats flying at sunset. In the villages near the waterfall, you can observe the daily activities of E De ethnic minority people- rice grinding, brocade weaving or and making hunting tools. You can also taste the local rice wine and local food specialties and hear numerous legends about the Central Highlands and the Dray Nur Waterfall.